They arrived by mobile bier garten from a neighbouring village to enjoy the Bavarian celebrations in Putzbrunn. Traditionally dressed party goers, women in dirndl's and men in lederhosen, join the celebrations in the Bavarian town of Putzbrunn, Germany. This group arrived on a tracker drawn wagon with an ample supply of beverages and bavarian delicacies from a nearby community to join the locals at the Putzbrunn Maibaum Festival. 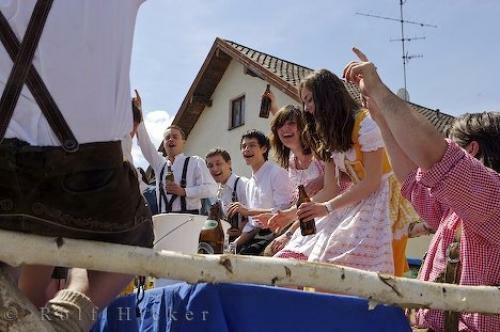 Photo of a group of party goers enjoying the Maibaum celebrations in Putzbrunn, Germany.